Here at Ball Green Primary School, we recognize the importance of building strong, nurturing relationships with the children. Therefore, we have recently introduced a new incentive to promote this ethos. A member of staff is paired up with a pupil to spend a small amount of quality time during a week to enjoy a book/story together. 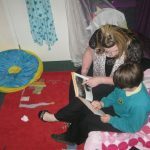 This not only encourages the pupils to enjoy and to further their reading skills, but also promotes positive relationships between children and staff across both Key Stages.